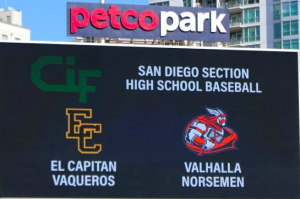 Valhalla and El Capitan sportsmanship line following the game at Petco Park on Friday. GASLAMP QUARTER (4-14-2019) – The appearance wasn’t exactly the one Morganna, the Kissing Bandit, gave to Pete Rose in 1969. 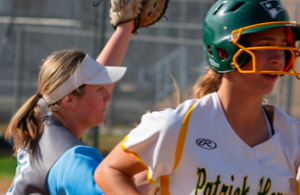 All the young lady wanted was the baseball from Valhalla High pitcher Riley O’Sullivan prior to the start of the second inning on Saturday (Spr. 13) at Petco Park. Valhalla junior JOJO INGRASSIA at the plate on Saturday against El Capitan. O’Sullivan instead headed toward Ingrassia, the first baseman. Instead, all O’Sullivan did was pivot away and walk towards first base, while the trespasser was escorted off the diamond. There was no cursing (like Rose), no kiss (as accepted by dozen of MLB players over the years), just a return to the mound to continue his dominating performance. 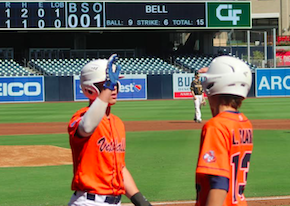 Valhalla celebrates a run in the first inning on Saturday at Petco Park. There were no lingering after-effects of the distraction. 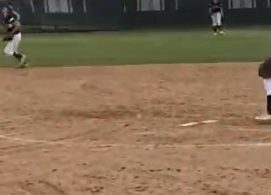 O’Sullivan simply went back to work, eventually striking out six over five innings, leading the Norsemen to a 9-2 decision over the Vaqueros. 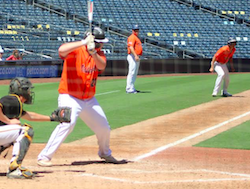 The contest was part of the San Diego Padres high school showcase series. It was the first Petco win for Orange Nation. The triumph also placed the Norsemen into undisputed possession of first place in the Grossmont Valley League at 5-1. However, it may only be temporary, as second-place Steele Canyon (4-1 GVL) still has to make-up a ballgame with El Cajon Valley. Ingrassia’s triple started a 6-run rally in the 5th inning to snap a 2-2 deadlock. The junior almost stretched it into an inside-the-park home run but put the brakes on after reaching third. No. 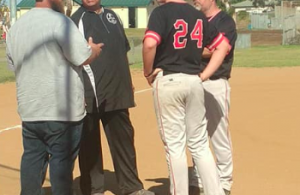 9 hitter Ryan Perot started the outburst with a one-out line single to center, Kyle Casper walked, then Ingrassia sent a line to right-center field which rolled and rolled to easily clear the bases. Aaron Lopez later added a run-scoring single to cap the inning, giving the second baseman two RBI for his second multiple-RBI outing in two weeks. Earlier, he knocked in four against West Hills. O’Sullivan yielded just five hits to raise his record to 2-1. However, two of the hits came to start the ballgame. 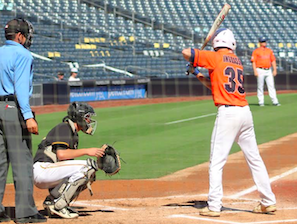 Valhalla’s AUSTIN SCRIBNER at the plate on Saturday. El Capitan catcher Jake Bergherm and left fielder Austin Barker stroked consecutive leadoff singles to center field. Bergherm eventually scored from third base on a double-steal. 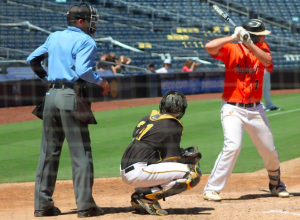 Valhalla answered in home-half on an RBI single by Ethan Dunnam, then a single by Luke Clark sent Dunnam to third, then home on an error in the outfield. 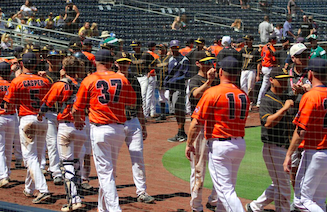 However, the Vaqueros tied the contest when Barker singled with two outs, advancing to second on an error, then home with the game-tying run on another error in the 3rd. For Valhalla (13-4 overall, 5-1 GVL), Casper batted 1-for-2, but walked twice, recording two runs and a pair of stolen bases. El Capitan (6-12, 3-3 GVL) received hits from Bergherm and Barker. The only other hit was a single by Dom Baker, a mid-game substitute second baseman, in the 5th.